1Pre-heat oven to 200˚C and place two large baking trays in the oven to heat up. 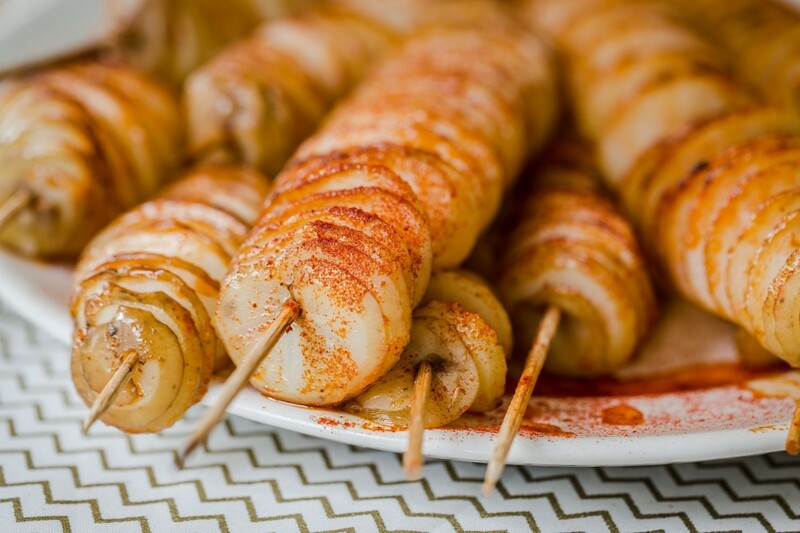 2Push a wooden skewer through each potato, leaving the potato at one end of the skewer. 3You can cut the potato into a spiral (or tornado) shape by hand by using a very sharp knife and cutting into the potato at the top and twisting it as you cut until you get to the bottom, or for ease use a potato spiral cutter. 4Once the potato has been cut through, fan it out the length of the skewer. 5Combine the olive oil with the paprika and salt. 6Using a pastry brush distribute the oil mixture over the potatoes and place on the baking trays in a single layer. For a healthier option spray the skewers with fry light and dust with the paprika. 7Bake for 20-25 minutes until golden and crispy. 8Serve the skewers as they are as nibbles or part of a meal. 9Also works well with various flavours (herbs, fajita spices, garam masala) and parmesan could also be used to flavour by sprinkling a small amount over the swirls a couple of minutes before the end of cooking.